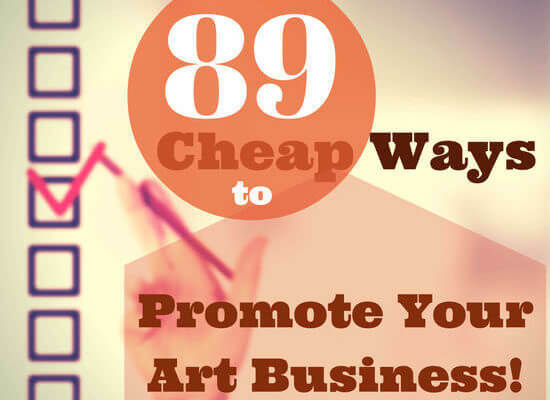 Here are some useful suggestions for you to promote your art career. You will find links to other Art Print Issues posts in the list. I mention this to emphasize the amount of free art marketing and art business information and ideas you can find here. If you appreciate the content, the best compliment you can give me is to forward the link to this page to other artists, or share it on social media. Let us know in the comments what unique things you do to promote your art business. Press Releases – understand the many ways your business is press release worthy and frequently submit. Blogging – use blogging to allow your collectors, fans and friends get to know you and your work to give a personal voice to your brand. Share your knowledge, not just tidbits about you and your art. Email list – use every method available to build a responsive email list. Send to it frequently to keep it fresh and your readers’ interest high. Free downloads – offer small size high-resolution downloads and encourage them to be printed. Offer to sign the prints when sent with a self-addressed stamped envelope. Include a catalog – include portfolio or flyer with every purchase. Portfolio – create a MagCloud.com online and printable portfolio. Use it as a gift when networking, as well as in other promotional ways. Donate – offer your work for the appropriate charity. Use the donation as a wedge to get involved in other ways that can help you network. Vehicle wrap – create a design to graphic wrap your car with your art. This may not exactly be cheap, but it could be fun, dramatic and a cause for publicity and awareness. Shortstack – use the many great, free ideas for Facebook promotion from Shortstack. Guest posts – seek chances to write guest posts on well-regarded and high-trafficked sites in the arts and entertainment niches. Vlog – create an ongoing video blog to share and illustrate your ideas, your work and experiences. Pinterest – you are in a visual business. Pinterest is a perfect visual platform with a massive female demographic. Use it to create broad exposure with high-quality images of your art. Cover top blogs – write a post about the best blogs and bloggers in the art business. Feature some of the top posts. This can open doors, builds relationships, and create social engagement where many you cover will in turn promote your article, and perhaps cover you, or offer a guest post opportunity. Donate – Give to a local or national charity, (It doesn’t have to be artwork), and gain donor’s page exposure with the possibility for backlink to your site. Logo – hire a graphic designer with logo experience to create your logo. Invest in the best because it should last you a long time, maybe even a lifetime. Use your logo on everything you create and produce. Business cards – although they are so 20th Century, they offer promotional value. Make yours standout with great design and add a call to action. Print material – make sure every postcard, brochure and every printed piece that carries you name is branded with your logo, color scheme, compelling images, and a reason to contact you now. Authority – use your in-depth knowledge about a topic to become known as an authority on it. Are you steeped in local history? Do you know everything about Renaissance artists? Have you visited and written about all the arts scenes in your local and regional area? Do you have a natural way of connecting food and art? If you are an expert, or are willing to study to become one, then you can parlay that knowledge in many ways as the go-to authority surrounding it. Google Hangouts on Air – start a regular hangout on a topic of interest to you. Invite other artists and notables to join you. Video demos – film yourself at work and provide a dialog on how you do things as an artists. For example, talk about the importance of underpainting, or building an artwork in the proper sequence. People may never want to do it, but they like being entertained by watching how others create things. Don’t limit yourself to YouTube. Upload your videos to Vimeo, Daily Motion and the other video streaming sites. Art happening – create one day or weekend events where you invite a bunch of local artists to congregate and create work. It could be a plen air picnic, or something setup with pop-up tents, or in a temporary space in a building, business lobby, or at a local mall. Referral program – start a formal referral program. Offer a percentage of the sale, credit towards new art, a giclée print, free framing, or whatever you find works best to have your family, friends and colleagues refer new business to you. Post your offer to make it public so everyone understands how your program works. 30-second speech – work on and refine your 30-second elevator speech. Practice until you sound natural and confident. Don’t rush what you are saying. Make eye contact while you are talking. Use a friendly, firm handshake. Smile while you are talking. Network – strategically seek events and targeted people you want to meet. Learn where your best demographics meets and become part of that scene. Attend social events, art openings, gallery openings and other arts scene events. Be ready to present yourself, (30-second speech), know what to ask about to get others talking, have a purpose for being there. Online presence – create online shops wherever possible. Some may not hold great value or need much of your time. Still use them to create online awareness for you and links to your website or blog. Focus on those that have top SEO results and quality in their products, such as FineArtAmerica.com. Sendout cards – join Sendout cards. Make your art available for other members to use on their cards and postcards. Leave behind materials – check events in your area. When there are conferences, meetings and shows that relate to your business, leave your brochures or postcards in strategic spots like visitor registration, hotel lobbies and so forth. Be-back offer – not everyone buys the first time they see your work. Create a printed offer with all your contact information and reason for them to come back. Give a discount on their first purchase, such as a free mini print with the original, free local hanging or tax-free first order. Test to find the best offer to pull the potential buyer back to your site, shop or studio. qrcode (1)QR Codes – create a QR code to put on all your printed materials. Link it to a landing page with a unique offer and a link to subscribe to your mailing list. Packaging – design stickers or screen prints to use on all your packaging. Include your logo, your website address, your QR code on anything that goes out from your business. e-book – write an e-book on a topic of interest to you. It could be about your life experience, your world views, what is like to be an artist, how to create art using simple shapes. Book reviews – write Amazon.com reviews about books you know your demographic audience will like. Provide book reviews for local media, or specialized blogs of interest to buyers you want to target. Google alerts – use Google alerts to monitor your prospects, collectors, media contacts and others you want to stay in touch with. About.me – create an About.me profile to create more digital content about yourself and backlinks to your blog and website. Contact database – start a contact management system with Insight.ly. LinkedIn – join appropriate LinkedIn groups and become an active participant.